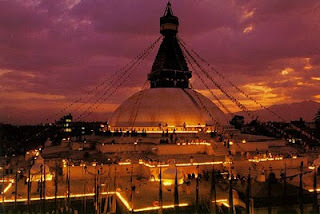 This one day Kathmandu World Heritage Sites Tour is a cultural tour in Kathmandu which offers a close glimpse of the valley. This tour takes you back in time through its architectural marvels. In this single day tour, we will let you experience the wonderful culture and architectural heritages of our nation; many of which are also included in the UNESCO World Heritage Cultural Sites. After having our morning breakfast, we commence our trip to the sightseeing of Kathmandu Durbar Square which is the excellent example of the development and advancement of art and architecture in ancient Nepal. Actually, Kathmandu Durbar Square showcases Nepalese art and architecture at its best. We will be able to witness the typical architecture developed during the reign of Malla Dynasty in Nepal. We then go to Swayambhunath Temple which has compelling blend of both Hindu and Buddhist shrines and stupas. Monkey Temple is the popular name among foreigners for Swayambhunath as it owes the large number of monkey popular in the area. After visiting Swayambhunath, we visit Pashupatinath Temple which is situated on the banks of Bagmati River and is the holiest temple of Lord Shiva. Numerous small temples exist inside the area of Pashupatinath. After visiting Pashupatinath, we visit the Bauddhanth Stupa which is one of the largest stupas in South Asia and build on the ancient trade route to Tibet. There are over fifty Tibetan monasteries around the area built by Tibetan merchants and large influx of Tibetan refugees over the years. The main stapa is built in a Nepali Buddhist style. Three Boys Apartment & Tours Pvt Ltd. organizes Kathmandu World Heritage Tour package everyday for its valued clients, If you are ready to attain a sense of purity and peace, please join us any day of the week! This is a one day tour, but the itinerary can be changed according to your convinence and requirements.